Do Experiences Lead to Greater Happiness Than Material Purchases? The August issue of the Journal of Consumer Research arrived in my mailbox yesterday. It contains an interesting article from Nicolao, Irwin, and Goodman entitled “Happiness for Sale: Do Experiential Purchases Make Consumers Happier than Material Purchases?” This is a topic we've skirted at Get Rich Slowly, but never fully explored. Many readers have offered anecdotal evidence that they get more “bang for their buck” by spending money on experiences instead of Stuff. Our results replicate those of Van Boven and Gilovich (2003), showing that, for positive purchases, experiences lead to greater happiness than material purchases. Also, there is a sense in which our results support the experience recommendation because we show that on average the most happiness obtained through purchasing is likely to be obtained through experiential purchases that turn out well. However, the experience recommendation in its pure form is incomplete. Our findings suggest that a lifetime of negative experiential purchases might lead to quite an unhappy life and furthermore that negative material purchases may not leave as much of a negative mark. In essence — and these are my words, not those of the authors — it seems that when we pay for experience, our happiness or unhappiness is magnified. Generally, however, we have more positive experiences than negative experiences, which leads many of us to conclude that spending on experiences brings more happiness than spending on Stuff. Positive social interaction is a major source of happiness. Experiential purchases often involve positive social interaction. Finally, exercise increases happiness. Experiential purchases can often lead to exercise. “Thus, positive experiences may be correlated with the basics of human happiness,” write the authors. When we buy experiences, we often inadvertently purchase things that contribute to happiness. A new $1000 flat-screen television won't give you social interaction, won't help you achieve your goals, won't give you exercise. By paying $1000 for a week-long bicycle tour of Oregon will do all three. The latter is more likely to make you happy. Materialistic people tend to receive equal happiness from positive purchases, whether they're experiences or material goods. Our feelings about a material purchase fade more quickly than they do for an experiential purchase. For example, I still feel happy about the vacation Kris and I took to Victoria, B.C., in 1998, but I'm no longer ecstatic about finding a rare Tintin book on that trip, though it pleased me greatly at the time. As I gradually reduce the Stuff in my life, I've been thinking about what I can do to improve my happiness in the future, to not become so absorbed with material possessions. Kris and I have already decided that we'd like to focus on travel. I'd also like to take some classes (photography, French). Essentially, I've decided on a sub-conscious level that I'd rather pay for good experiences than Stuff. There are 59 reader responses to "Do Experiences Lead to Greater Happiness Than Material Purchases?". If you think about it, most material purchases involve some hope of an experience. Oh wait, you didn’t want a literal answer to the question? But seriously, this has been a central part of my family’s young journey. We try to constantly sacrifice material goods & possessions (although it’s extremely stressful at times), because it multiplies the freedom we have to EXPERIENCE more (and makes the experiences themselves more vibrant). Thanks for shooting over the interesting post. I loved it! The answer is ABSOLUTELY YES! Experiences lead to much greater happiness than material things. I remember when I was living off of $100USD a month living abroad during college. I slept on a wooden plank, and it was 90 degrees in the summer day and 80 degress at night. We had a fan that moved across the room every 15 seconds. I was broke as beans and yet, that summer abroad was one of my happiest memories ever. We shy away from spending bucks on experiences b/c we feel they are temporary… yet the memories stick with us forever. Hence, invest in a fantastic camera, and have a journal! Experiences will always rock on over material items. Simplify everything and get rid of junk. I tend to purchase hobby supplies and related books(electronics, programming and astronomical related mostly at the moment) which equate to long term experiences for me. I’ve learned more about the world I live in, hung out with the local astronomy club, etc, and for me that’s a much better value then a 3 day bike trip. I’d rather buy a new bike and find some local people to ride with! With the Internet and sites like meetup.com, it’s easy to find or start a group to turn your things into group experiences. In that way, I think the experience vs material possessions distinction is very fluid. My wife likes to watch about 1 ~45 tv show a day, and for her a Hulu subscription is an experience. In one way or another, everything we buy is something to bring us an experience. Please tell this to my in-laws. They spent all of last month visiting us from out of state and didn’t. do. one. thing. We kept trying to make plans, to create some new exciting experiences for all of us to take part in together, but they kept citing money issues and “we can’t afford to go to the amusement park/swimming/hiking/camping/dinner” etc. And by the way, some of these things didn’t cost more than $3. BUT they took daily, multiple hour long shopping trips to Walmart, Costco, outlet malls, and told us of their overnight victories on ebay. They had to have an extra car to carry all the stuff they bought while here, back home with them. It’s their prerogative to do whatever they want while on their vacation. I just found it very perplexing. My husband and I were discussing it, and I kept asking him, “but what about making experiences? Can buying stuff really be that satisfying?” He said that for them, unless it led to some tangible end, it wasn’t worth spending the money on. I guess for some, this article isn’t true. I really enjoy when you can combine experience with material purchase (the ultimate “happiness” bang for the buck). Example: my purchase of a 2004 cobra SVT mustang. A material purchase? Yes. An outstanding experience every time I drive it? Yes again!!! Experiences generally add more than material possessions. But I don’t buy into any suggestion here that you need to pay money to have experiences. You can research a question you have always wondered about at the library for free. You can go on a long bike ride with your spouse for free. You can go back and listen again to records you cared about when you were young for free. You can visit old people for free. 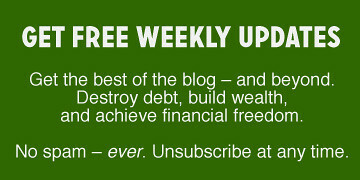 You can write a budget (better called a “Life Plan”) for free. You can play cards with friends for free. You can learn how to cook new dishes for free. You can practice guitar for free (presuming you already own a guitar). The plus of experiences is that they are not passive, like TV (which has its place but which is often overdone because it is so easy). Hi J.D., this is a topic I love. There’s an element missing in the calculation, though, and that’s an individual’s propensity to fear new experiences. There are many who say they want to travel, for example, but who are actually afraid of being out of their comfort zone; sometimes to such a degree that they are predisposed to view the travel experience negatively and to remember it as a bad experience, even if they enjoy specific moments, sights or activities that were unique to the travel destination. They complain about every minor inconvenience, delay, or misunderstanding and focus on those things because they are fearful and reactive. Someone who wants to see France, but who wants to be as comfortable there as they are at home in, say, Kansas City, is likely to have a “bad” experience. Travel is inherently uncomfortable: you have to haul stuff, and you can’t control your transportation, sleep quality, food, or leisure comforts the way you can at home. “Know thyself”! Some people turn every experience into a bad experience just because they are who they are. For them, the flat-screen is a better choice. Nate wrote: I’m sure JD feels the same way about his Mini. I think that’s a great point, actually, Nate. When you buy something that you’ll use, something that helps give you experiences, you have both a material thing and the experiences themselves. I’ll bet this can lead to all sorts of enhanced emotions. Yes, but just think about all those painfully expensive purchases one has to make just to survive. Things like medical care, a new roof, new furnace and air conditioner, things one purchases out of need rather than desire and still regret having to pay for but have little choice about. A co-worker of mine and his wife have an awesome policy: Every time they GO anywhere they make it point to do something that they know they will remember positively for the rest of their lives. Any time they BUY something, the rule is to do something with it that accomplishes the same thing. I love #2, especially the part that goes “multiplies the freedom we have to EXPERIENCE more.” Some of my best times in life have been when I’m moving; all my stuff is packed in boxes, so I get out to experience life more. I’m still working on shedding my stuff (rather than just leaving it packed), but I generally am more happy having experiences. I went to New Zealand a few years ago. I spent $3000, including airfare, on my 3 week vacation. I slept in hostels, made my own food, and didn’t buy a single souvenir. I DID buy lots of postcards for friends and tons of experiences. And let me tell you, I am so happy that I went kayaking, horseback riding, river surfing, went spelunking/rapelling in caves, took a day-cruise, and went to lots of museums. To me, that’s way cooler than some fancy meals and a kiwi stuffed animal (not that there’s anything wrong with fancy meals — I like eating well — but I saved money for one good meal and cooked everything else instead of eating out every day and not having cash for the adventures). Yes, we can spend some money to acquire a few things that help us do more. But, for me, I find that only the carefully thought out purchases for activities I already do are worthwhile. After that, it’s better to just get out and have fun with what I have instead of pining after more/better gear or buying more crap. Absolutely, anytime those experiences involve friends than it sticks in your mind greatly. I can’t think of more than a handful of items that bring me greater joy than thinking back about studying abroad in Australia. We played golf on a guys weekend and although we paid for dinner (extra 10 bucks) I will always remember golf and the fun but never the 10 extra dollars. Budgets can’t stay too tight for that long, if your getting out of debt thats cool but any longer than a year or 2 and you start to miss out on life. J.D. What a great post! It is funny how often the demographic of people that are successful with their finances also check the box “travel” as their favorite things to do. Keepsakes purchased during travel more often remind the traveler of the trip, not the keepsake. I wonder what people would prefer more – to retire, or to “be” retired having have the retirement experience? Does our number mean anything other than we get to experience retirement? Might be another article? But the second-best purchase was the mandolin we bought while on vacation: we spent a full day meandering through music shops (and getting happily sidetracked in other neat spots in the city) until we found it, and now it’s a fun instrument we can pick up and play any time. Except for photographs, this is the only tangible “souvenir” we have from that trip, and it continues to bring us joy. I suppose musical instruments, if used, are more “experiences” than Stuff. The only reason *to* buy stuff (in my opinion) is because it’s going to improve your experiences. If you take the flat-screen television as an example, what’s the experience improvement you’re buying for your $1000? You get the same old thing you had before, only slightly bigger and sharper. It’s not something fantastically new, and the stories it shows you are the same as your old TV. If you spend your $1000 on a trip to Hawai’i (or wherever) you get to see things you never would have seen at all otherwise. The impact the trip has on your life is vastly greater than the impact that the TV does, and as such it has a lot more potential to affect your emotional state, in either direction depending on how much your enjoy the trip. This makes perfect sense to me, and I agree completely with the proposition in the post title. Spending money on things that have almost no potential to change your life (or at least, to keep it from changing in a negative way) seems unlikely to change your disposition much. This is the same reason that I don’t understand owning 15 of the same thing — the experience from each is essentially identical, so why do you need so many? I’m thinking of things like having enough pairs of jeans to wear a different one every day for a month, or almost every hobby that’s based around collecting things, or upgrading to the newest laptop every year and keeping all the old ones, “just in case you need them”. There are plenty of other examples, but I see people doing this all the time. Certainly there are exceptions — I can think of reasons to own three different bicycles that would look nearly the same to a layman if you used them for different types of racing. I could even see owning six, if you wanted to always be able to ride one of each type even if you had to take one in for service. But to fill your garage with 15 bikes that you never ride — that seems like waste of money you could have spent on something that would affect your life much more than having a full garage does. And if you get right down to it, almost *all* of our purchases fall into the category of, “another one of a thing I already have”. How often do you purchase something that gives you a new experience versus something that gives you the same experience as before? Contrast buying a wetsuit so you can learn to scuba dive versus a new t-shirt, which is pretty much exactly like the 35 t-shirts you’ve already got. Of course it has less of an impact on your life than the wetsuit, you already know exactly what experience it will give you — essentially none. I’d be curious to see how someone can objectively compare this kind of thing to analyze it. Do you do a dollar per dollar comparison between buying “stuff” versus buying experiences? Are they trying to say that every $1 spent on experiences will get me more happyiness on average than a $1 spent on buying a physical item? How do you compare $30 for a night out at the movies, buying a video game for $45, $1500 on a weekend trip to Vegas and $5 for used book? Is the experience of going out to eat and spending $60 worth the happyiness I gain versus eating at home for $10? Is the result of this study maybe just a reflection of the fact that people enjoy travel a lot? Just because you spend a lot on an experience, that won’t automatically make it unforgettable! And many times the experiences are better *because* you have spent little on them—bumming your way around Europe or hitchiking across the US–you literally can’t buy those experiences! My own preference is for experiences that cost little anyway. I would always enjoy hiking in the woods more than attending an expensive rock concert. I would always enjoy throwing a dinner party for my friends at home more than dropping major bucks by taking everyone out to a fancy restaurant. I think positive experiences tend to become more important with age. Many good experiences = a life well lived, and the memories grow and flourish like a well watered garden. Perhaps this is because we can relive and retell them, and maybe also look forward to repeating them. Things on the other hand, tend to have a short shelf life. A new car for example, is most satisfying in the first few months of ownerhip, and quickly declines as a “high” with time. Also, when you come to the end of life, it’s far more likely that you’ll remember what you did in your life, not what you had. Life is, after all, an experience, not an accumulation, modern tendencies toward acquisition and consumerism notwithstanding. That’s not true in my case at all. TV + Xbox Live = social interaction and fun with family in friends thousands of miles away. You really can’t do that with many other mediums. the internet. Also there are cooking shows, etc that can hone my skills. I have my treadmill in front of my tv and watch shows while I run. I have traveled extensively to rather exotic and far flung countries and locals. While I usually enjoy traveling and try to go often, I have found that more than the location, and how “beautiful” or “awe-inspiring” it is, is how my companions were. I have been on terrible trips that include being without a place to stay , having to sleep in cars, being without money but have had a memorable and great time because I was with someone who I really meshed well with. On the other hand I have been to amazing places, like Angkor with people who I just had a superficial connection with. While the place itself was amazing, my memories of that trip are relatively vague. The time and money spent on that trip seems more of a been there done that experience. Similarly with purchases, rather than how the purchase turns out even when I buy them or even how useful they are, I felt the best about ones that I could use with friends and loved one. Purchases that have brought me together with them or on the other hand have brought about great times. This may just be me, but I in some ways regret traveling so extensively and spending tens of thousands of dollars doing so, because I have in the end found that 3 day road trips to that city just a few hours away as rewarding as the $3000 China trip because I spent it with people whose company I truly enjoy. Initially, I thought it was the experience of going to exotic locals that made those trips so memorable, but in reality it was making connections with the people I was with that made them matter. I suppose this may fall under “good” experience, bad “experience” but I think it applies to material goods as well. My boyfriend never appreciated the milk shake machine he bought until I found it and we made it a weekly habit of making them. Until that time it just sat unused in a cupboard collecting dust, a thoroughly wasted purchase. Yet, we now enjoy it fully, even inviting friends over to have little ice cream socials. Trips, while they may feel like experiences, often cost money and are essentially purchases. They much like material goods, create the opportunity for making experiences. Even trips that can last months are essentially ephemeral. It is when those trips can create friendships that stand the test of time that I can look back and truly remember them fondly. An experience purchase can be just as useless as that gadet you thought you needed, but never really used. Tickets to a school dance. Tickets to a musical everyone was raving about. 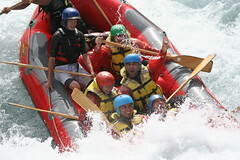 That white water rafting adventure. All things I spent money on at one time or another that I didn’t enjoy. I bought all these things because someone else was going and convinced me I would enjoy it. No different than all the people who are trying to convince me I need to get a TIVO. Saw a video yesterday that was circulating about Deepak Chopra being interviewed on Ellen DeGeneres (sp). I think the interview was probably from January because she asked him what he wanted to concentrate on this coming year. He replied, quite simply, to covet relationships, not material possessions. This jolted me at the core. I think this falls in line, exactly with the experiential spending. Wouldn’t it be so much more fun to book a wine tour in Italy (assuming you like wine) with friends or family than to by a big screen TV? Sure the big screen lasts longer than the trip, but the pleasant memories will conversely outlast the big screen TV. well stuff like books and CDs do provide some sort of sensory experience–both inspire, both expand your imagination, both stoke your mood and make you happy again and again when you re-use them. None of those reasons of why experiences make us “Happier” than stuff really rang true to me. I think the reason an experience (good or bad) affects us more is because it is a memory. Stuff becomes background and doesn’t make an impact in our personalities, at least not a big one. Versus an experience is an experience BECAUSE it is out of the ordinary. Therefore it is a memory and becomes part of your history and will be mulled over in your mind in the future in a way that new TV doesn’t. They can also signal decision points in your life, either overt (moving) or covert (that trip when you fell in love with the SW and retired there years later). An experience becomes part of us in a way that an object can’t. And I disagree about the car being an ‘event’, at least for me. A house is because there is the event of moving and it can have such an impact on your family and dynamics. But a car is transportation. Unless it’s your dream car, a race car, or a car you buy so you can take cross country trips, it takes you from point A to B. But as a girl I might just not ‘get’ the car thing ;). That’s actually impossible. Possibly, you have just discovered that on some sub-conscious level you have developed a preference for buying experiences rather than material things. My guess is, you are actually justifying your goal of reducing the ‘stuff’ in your life by adopting a love of purchased experiences. Good for you! I’m a pack rat and I can’t break the pattern. It’s going to be one heck of a mess cleaning up after me when I’m gone. I think the key word is “experience” though in some ways experiences are attached to stuff. If you watch a lot of tv or if you like to host movie nights at home (an inexpensive way to spend time with friends) then $1000 for a kickass tv could prove worthwhile. Same can be said for books, music, or artwork; if you use and value it, it can make you pretty darn happy. As for spending on a trip instead, that value depends entirely on the experience. Going someplace fabulous with my entire family, for example, would be a lousy use of $1000: my husband would be bored, my siblings would fight, my parents would complain, I would be stressed out trying to please everyone. That same $1000 would get me 3 out-of-town races with my dragonboat team – every single one exciting, memorable, and a total bargain. We might win or lose, we might eat at nice restaurants or eat Costco sandwiches, we might stay at posh hotels or in hostels, we’ll cram as many people as possible into a hotel room or a car, we’ll drink cheap beer, and we’ll love every minute of it. Spend money wherever it makes you happy, and don’t get hung up trying to overanalyze whether a purchase is a ‘thing’ or an ‘experience’. In the end, matter and energy are all the same thing anyways. I personally doubt the solution to a lifetime of material indulgence is to start diverting all of you money to experiences. Think comic books are expensive? Start taking first class flights to Europe and staying in four-star hotels. You can easily spend more for one night out on an international town than you can for a big screen TV, experiences are something where it is pretty easy to keep throwing money when things aren’t going well. Stuff is mostly cheap junk and pretty much all imported from China, it is very inexpensive, you can’t spend that much on stuff unless you’re into rare collectibles or something. I personally never got into spending money on things except for maybe a short phase. Probably everything I own now (except a couple pieces of furniture) can fit into the trunk of a Mini Cooper, and I don’t own anything more than a couple of years old. I got into debt due to travel, my mother once remarked, “You have nothing to show for your debt”. I purchase very close to nothing, but I do tend to highly value the very few things what I do buy. I think a great handmade pair of shoes is a beautiful work of art for example, and I would happily trade one of the countless forgotten random drunken nights in some exotic locale which I’ve experienced for a nice pair. It’s all balance and a happy life will have the right mix of both. Don’t take either things or experiences to the extreme and you should do all right. Yes , it’s called making memories. If you bring your kids the the ocean and the see dolphins swim by, years later they will remember that. The toys you bought? Not so much. YES. They do. It only took me 40+ years and a house full of stuff I no longer am interested in to figure that one out. Obviously, as even your post suggests, this varies by person…some people may get more happiness from material purchases, but apparently most people do not. Fair enough; I can buy that. In my case, I have to consider the fact that experiences are great for the moment; but since I have a very weak, nearly non-existant, long-term memory, the happiness an experience might give me at the moment will be lost before too long…while some material purchases give me happiness for years and years. For me, though, it’s about making wise choices and making sure that I am selective about my material purchases, so that I don’t end up buying lots of useless crap that gives me no happiness whatsoever. “Making Memories” is a nice concept; but I can honestly say in my case that it’s pretty hard to do that. That said, I do enjoy living in the moment, and I do still value experiences — not necessarily more than material purchases though. This is a tough, and sometimes, touchy subject. I remember talking with a lady here in Poland who had no running water or toilet inside her apartment. (If she wanted it, she had to put in the plumbing herself–the gov’t doesn’t pay for it even though it is gov’t housing). She was saving for a vacation. I remember thinking that if I had been in her situation, with kids, I’d prefer to forgo the vacation and get the indoor running water. Why? Because once you have the water, then life is easier “every day” and your vacation will be over after one week. So, we did that. We did forgo vacations for years while building our house, trying to finish it up (out of pocket). Now, we can take vacations–at least more often than before. The house is paid for. I couldn’t understand going away for a vacation if I didn’t have hot water in my house (with 5 kids). It was a matter of priorities. Once the basics of life are covered, I agree completely–experiences are great. But, until you have the basics covered in the place where you live, experiences are just ‘escapes’ from your daily hardships. For me it was more important to release pressure on the bottom line of daily life–far more than any vacation. So, I needed “stuff”–kitchen cabinets, pots, pans, hot water, flooring, even a few decorations for the walls, etc. Now I have the stuff in place–I want a vacation and I want to travel–not just stay home. This may not apply to any Americans, because the standard of living is different there, but over here, where many people live without running water and yet go on yearly vacations…hmm. I simply don’t ‘get it’. I’ve felt this way for a long time. I’d much rather shell out money for an experience than a thing in order to obtain a bit of happiness. The ‘thing’ will just get old and forgotten, but the experience will be shared with friends, and will be fondly remembered for the rest of my life. And experiences can sometimes be free or low-cost. When it comes down to paying for happiness, I’d rather pay for good memories of wonderful experiences. I think so. I recently bought a new flat screen TV, and I’m incredibly happy with it. It’s one of the better “material” purchases that I’ve made in the last few years, along with my magic bullet smoothie maker. However, I’ve also gone to Toronto and the ocean with my friends this year, and I think those things will stick with me much longer than the TV. Being a little materialistic isn’t bad, but ultimately it’s the things you do that matter most. I think the one thing most folks forget is that with a material possesion, either you end up using it daily, in which case it’s no longer a novelty, or you park it somewhere and it sits, in which case its no longer of real use particulary when your memory of it conflicts with the reality when you see it again. Experiences are typically the same way. If you ride a roller coaster a dozen times, the novelty is gone, and the experience suffers. If you go as an adult to the same place you vacationed as a kid, chances are the experience won’t be the same because the place is not likely to live up to your memories of it. Add in that we tend to recall the “highs” out of most experiences, and conviently suppress the “lows”, and it makes sense that the experience brings back better and stronger memories of happiness than possessions. I also feel we tend to polish that “high” to make it even better when we tell folks about the experience because there isn’t a solid physical link forcing the reality back into our minds. So you’ll likely “mute” the memory of the nasty sunburn on your ears and multitude of bug bites since you forgot the sunscreen and insect repellant, because the actual white water rafting event was such a “high” and will be what you focus on when you talk about the experience to others. Or just as simple, you overlook the hours taken to get to a concert, hassle in parking, crowds and lines through the doors and into the arena, and then hours of boredom waiting for the band to show, all for 60-90 minutes (if you’re lucky) of show. Meanwhile, that high you felt when you got that great piece of art you bought two years ago and thought was so cool just doesn’t reoccur when you happen to look at the item, partly because your “memory” of it is forced back to the reality of it when you see it again. If you’re lucky, you have a fond satisfaction, but hardly a “wow” when you look at it anymore. Based on the comments it seems like there’s a strong concensus in favor of experiences over things. I think this is as it should be because life is what we do with it (experiences) and not what we have (things). I think it’s very much subjective. I tend to side with the minority of dissenters – I’ve been skiing all over Europe, been to Barbados, Vegas, Amsterdam, Paris, Milan, Madrid, Barcelona, Menorca, Dublin, and so on. I don’t travel much any more, because I don’t feel that I got value from those vacations. And, genuinely, I don’t remember much about them at all. Barbados in particular – we visited some caves, took a submarine ride around a shipwreck, and attended a cultural cabaret evening; two years later I was chatting with a friend who was also there and I found I’d forgotten about all these things. I hate to think of the thousands I’ve spent on experiences that have evaporated within a matter of months. Worse is the fact that the actual act of travelling is so dull, and a delayed flight home might be the only thing I remember once some time has passed. The only exception I can think of is running with the bulls in Pamplona, which I’ll always remember. Some (not all) of my material possessions, however, have been making me happy for years. I love my leather sofa, I love my Italian fridge, I love my Bosch lawnmower, I love my Cuisinart food processor and my Sabatier knives. Every time I use any one of those things, I’m glad I spent a little extra on them. It’s hard to say. I do believe though that if you have more material possessions, you don’t enjoy the experiences near as much. However I don’t think that was QUITE the point :P.
You know, I read an article about this exact same subject on MSN Money a few months back, and they pretty much agreed with what they say in the Journal of Consumer Research. (wish i could find a link to the msn article) But it does make sense. If you have a good experience, you don’t feel like the money spent was a waste. When things go horribly wrong you begin to second guess why you spent that money and decide it wasn’t worth it at all. As someone who just went Skydiving yesterday (woot woot!) I’d have to agree whole heartedly. Looking at what we spent on paper, $200 each for the dive, a full tank of gas to drive up there, tolls for the highway, cost of food, etc. one could maybe look at those numbers and cringe. But the feeling I now get from saying I did it and I survived! it’s worth so much more than was spent on the trip. And I wouldn’t change it for anything! I’m a bit torn. My experiences are ones that I wouldn’t trade for the world. I’m still paying off my 2006 trip to Europe even though I was back packing and staying with people the whole time. It made me so happy that I don’t mind the expense. There are lots of things you can do for free that make for just as nice experiences. A lazy day in the park with my boyfriend and a picnic is as memorable to me as the first time I went to Disney World. It all depends on perspective. On the other hand there are some purchases that I have made that have brought me more happiness than a trip ever could. A great example would be my cats. They were bought and paid for and 3 are still an expense to keep up. The memories I have now formed with them have been some of my most loved experiences. I guess the rule is it doesn’t matter whether experiences make you happy or things. Just be happy. If we’re saying that paying for cars gives us both material and experiential happiness, it is of course a HUGE YES! Not only does owning my cars make me happy (And owning them with almost no loans. Two out of three aren’t financed, and those are the two more expensive…) but they give me a TON of chances to be social with other car guys and such. I guess it’s pretty obvious, but a mix of the two (experience + material) makes me happy. Spending mindlessly does not make me happy, but the Coach bags I own do. Sure, the money I spent on the few bags I own could have paid for a big chunk of a vacation, but I carry a bag daily and it makes me happy. Would I buy even more bags and never go on vacation or out for dinner? No. I am quite a materialistic person but I certainly see the value in experiences over “stuff” – you just have to find the right balance. This post made me think about where I’ve spent the most money the past few months. After the house payment, the three biggest were food, skiing, and a trip to my parents’ lake house several states away. I buy the most Stuff in order to cook and consume meals, but I wouldn’t be able to enjoy the experience if I hadn’t bought the ingredients. I love to ski and couldn’t go as often if I didn’t own the equipment. The current spending for the lake vacation was pure experience, but the trip would have been less fun if I didn’t own my Miata to take there. As others have mentioned, when your Stuff leads to experience I think you get the most enjoyment. If you’re interested in a new approach to boost your happiness based on the latest positive psychology research, check out our iPhone app: Live Happy (there’s also a Free Trial version); it’s based on the work of Dr. Sonja Lyubomirsky, author of “The How of Happiness” and provides a unique method to create a personalized program to increase your happiness. 1) How many pleasant experiences do you remember from your childhood? 2) How many really fun toys do you remember having during childhood? Might help to determine if you’re a things person, or an experiences person, if in fact either is a personality type at all. Saving up for a trip to Japan. Also saving for a Canon 5D II camera. Both may cost around $3K. I won’t have as much fun experiencing Japan with the Canon 5D II. Loophole! Expensive Loophole! Such great interpretations of this “thought” from everyone! In my personal coaching, often it comes down to what gives you the most fulfillment in your life…and as we can see, every single person is different. It’s not black and white by any stretch. For some, a nice car gives such a sense of accomplishment, and enjoyment. The point I make to my clients is that in MOST cases, people end up tied to the costs of their possessions that do NOT drive happiness and ultimately, fulfillment. They drive the BMW and Lexus to primarily “keep up with the Joneses”. The problem is, the monthly cost of owning these cars gets in the way of many EXPERIENCES they’d like to have also…that would provide much greater fulfillment. 1) Does this expense provide fulfillment? 2) Is this expense in alignment with my core values and what’s most important? 3) If I was already Financially Independent, how would this expense change, or differ? These 3 questions provide amazing clarity on if you’re spending money on the right things! I use them everyday personally. Fascinating to read the article & all the various responses. I must agree wholeheartedly with HW that what I paid/pay for my dogs (to get them & keep them) is without a doubt the best money I have or will ever spend. I am also one of those who buy items that offer long-lasting experience. I’ve owned my pottery wheel for more than ten years now & it has paid for itself many times over in great experiences, in artwork sales & in creating a healthier, much less stressed human. While I treasure the memories of my trips when I was younger, I revel & grow as an artist & human being through creating with the material purchases I make. Trips now are short weekends to the city to shop for art supplies, wander through galleries, & visit with other artist friends where we network & inspire each other with new ideas & creations. I think its the experiences that don’t happen often which make them more memorable. I took a trip to Florida a few years ago and it is very memorable. I hadn’t been there before or since. I go to Vegas 1-2 times a year and have been there 1-2 dozen times. Vegas trips are not very memorable for me. I become accustomed to going to Vegas so it doesn’t stand out in my mind as memorable. Its almost routine to go to Vegas. The material possessions we have are things we become accustomed to having. They are a routine part of our lives. We’re used to it so we don’t think about it. I think the real measure of how much happiness a material item brings you is whether or not you’d sell the item to pay for for an experience. I wrote an article on this topic a few months ago, and found another interesting study on spending. Researchers at UBC and Harvard found that people who spent money on others were happier than those who spent just on themselves. It didn’t matter if it was five dollars or a big fat bonus check. People who bought gifts or made donations reported greater long-term happiness than those who spent all the money on themselves. I’d like to see what happens if you put that research together with these findings. In other words, are you happier buying someone an experience rather than an object? Another point here is to focus on having a good attitude when paying for an experience. If paying for that experience magnifies your feelings about it make sure you’re mentally ready to enjoy that experience! As chacha1 and others have alluded the way you react to a situation affects how you feel about it. You can’t control the world… only your reaction to it. I think it’s fascinating how experiences and material possessions can affect people differently. This article makes some good points and was fun to read! I find I’m happiest with an experience that has a small material item to trigger the memory. It doesn’t have to be lavish. For example, a Christmas ornament bought on vacation or (as I’m a shutterbug) tons of photographs. One notable downside to spending money on experiences is that you might become an ‘experience junkie’ and want to recreate the magic every weekend at a high expense. I absolutely believe purchasing experiences make me happier. My husband and I love to go to concerts, ball games, and amusement parks. We have a wonderful day and memories for a life time. I much prefer that to buying a new purse!